The North Pole is easier to navigate than the South. Ridges and rubble provide waypoints and contrast even in foul weather. It is enough to carry the compass in your pocket, as you will only have to bring it out from time to time. Yet ice drift, leads, rubble and ridges will deviate you from your point of direction. It is important to keep waypoints far on the horizon in order to not get lost in the maze of the Arctic ocean. 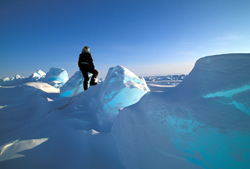 A good strategy is to climb up an ice ridge prior to travel - a k a "scouting" - and a few more times through the day. It will give you an overlook of the terrain and help you to avoid large leads and ridges. Another problem unique to the North Pole is the dense fog. This grey and dull blanket of damp air is a spooky sight. Ridges, ice pinnacles and ice boulders will emerge out of the fog like ghost ships at sea. Open leads will show their black grin just as you are on top of them and thin ice will be difficult to spot in time. Fog is mainly a problem of the late season around May. The large areas of open water vaporize into low clouds that cover the area almost permanently. Apply the rules of South Pole whiteout navigation when in North Pole fog. Same rules apply for the Arctic, except the sun and the shadow will move the opposite way. If facing the North Pole your shadow will travel from left to right during the day. At 12.00 PM the shadow will point directly towards the North Pole. "Fast ice" or "screw ice" is solid pack ice. This old ice is often rugged with old sastrugis smoothed at the edges by the wind. "Pack ice" or "new ice" is floating ice formed by frozen seawater. "Ice floe" is a flat chunk of pack ice, also called "pan". "Ridges" or "Hummocks" is a place where pans of pack ice have piled atop one another. Thin and dangerous ice is commonly black, whilst thick, old, frozen and safe ice is light in color. Check ice safety by poaking it with the ski pole. One poke – too thin. Three pokes before going through the ice is fine. Two pokes – be prepared to possibly fall through and move fast. Thin ice piled up into ridges is easily recognized by a brilliant blue or green color. Pressure ridges are sometimes only low "fences" between pans, but can tower up to 15 meters at places of particular disturbance.